Amidst the flooding in the capital, power outages(dumsor), water shortages and riots against demolition of housing without properly planned relocations, Accra has had its fair share of instability and threat to harmony these past few weeks. At the same time we find fuel prices going higher (just last Tuesday, 16th June, 2015, prices surged up by 4%) and the cedis keeps on taking a series of plunges in the face of the US dollar, Euro and Pounds Sterling. Artists who are in touch with their immediate environment, have been creating to illuminate these issues, cautioning the citizens to be aware and keep awake as their country and home is continuously threatened by these conditions and the leaders who do almost nothing to resolve things. Wonna Mama is a call on all citizens of Ghana and the continent’s (Ghana’s mama’s) inhabitants to push for the best and connect with the aim to solve their own problems, without reliance on the so-called leaders, who have failed massively in terms of regional integration, economic and infrastructural development, etc. As projected more vividly with Martin Luther King Jr’s quote; “the ultimate measure of a man is not where he stands in moments of comfort and convenience, but where he stands at times of challenge and controversy,” we as artists seek to portray the state of the nation and explore possible measures to tackle this death-fall. Since kwame write released Public Verses Announcement EP, enthusiasts have been calling for more, especially as they realized he had the flair for rap aside poetry recitals. It gets realer as kwame write features one of Ghana’s most renowned musicians with a solid sense of social consciousness and activism; the one and only Wanlov Kubolor of the Fokn Bois’ duo. Pidgen English is mainly used in a verses each by the artistes interspersed with sampled vocals from the emphatic politician, international showman and businessman Kofi Wayo. Press play and get sizzled by the fast paced long syllable rhyming and positive content. C-Real brings Wanlov in on this track that just needs to be heard to be understood. It’s a message to Ghanaians and it’s been a long time coming. Ghana has been facing the same problems for generations now through all its governments and it seems its time the people took a part in bringing in the change. This track is a call to action for all Ghanaians to join hands and make that happen. Chale We Dey tells the story of a typical Ghanaian mindset and the situation the masses face due to bad management of the state. Check out the duo on one the best and most honest songs of the year. 19th June – 17th July 2015. Museum of Science and Technology. Accra. 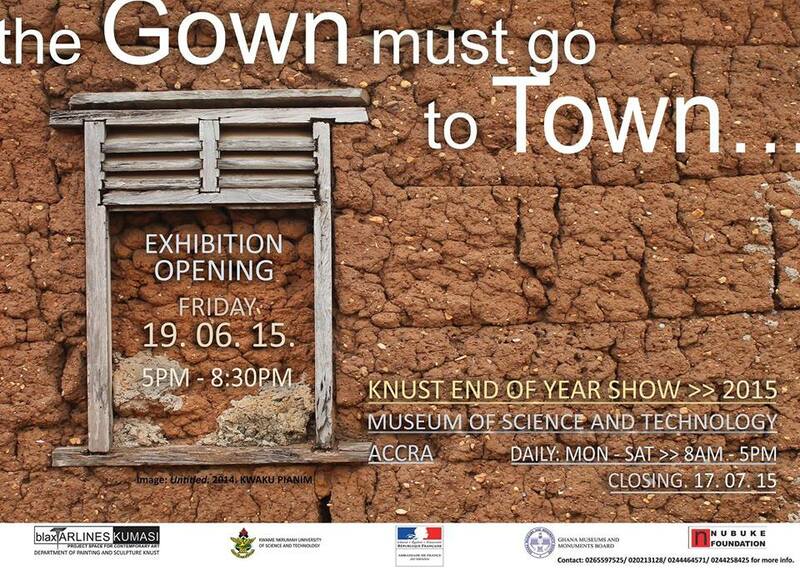 With the Gown must go to Town, the Department of Painting and Sculpture of the Kwame Nkrumah University of Science and Technology (KNUST) celebrates its recent past student Ibrahim Mahama’s participation in the 2015 Venice Biennale as the youngest artist of the International Exhibition All the World’s Futures. The Department also congratulates its past student El Anatsui for his Golden Lion Lifetime Achievement awarded by the same Biennale. The Gown must go to Town features the works of the Department’s 2015 graduating class of BFA students and selected teaching assistants. Also featuring are six special guest artists, all graduates of the same Department, whose works have featured prominently in other important platforms of contemporary art such as the I:54 Contemporary African Art Fair New York, SMBA’s Time Trade and Travel, Stedelijk Museum’s How far how near, the two Saatchi Pangaea Shows and Silence between the Lines in Kumasi. 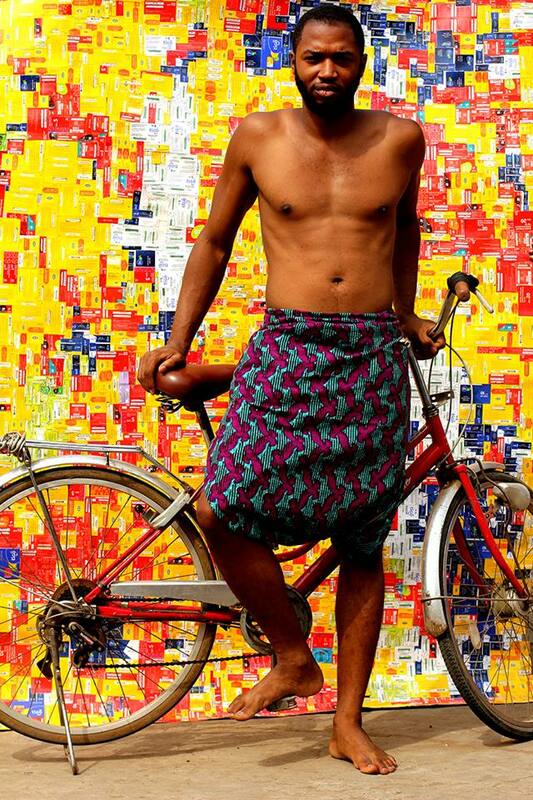 In the past decade, the Department has risen to become a hub of ambitious Contemporary Art in West Africa. The new spirit was instigated by an Artist Collective of young tutors inspired by kąrî’kạchä seid’ou’s Emancipatory Art Teaching. The Artist Collective and its networks introduced a new spirit of contemporaneity, material and political sensitivity, and reflective public engagement into the curriculum. The titular the Gown must go to Town, a précis of the ethos of the present curriculum, is a rehash of an important axiom in the acclaimed speech, The African Genius, delivered by Kwame Nkrumah in 1963. This edition of the KNUST End of Year Show is kindly supported by the Ghana Museums and Monuments Board, the Nubuke Foundation, the Cultural Attaché’s Department of the French Embassy, and friends of blaxTARLINES KUMASI, the Contemporary Art Project Space of the Department of Painting and Sculpture, KNUST. Exhibition Opening: 5pm-8:30pm. Friday 19th June 2015. Open Daily: 8am-5pm. Mon-Sat. 20th June- 17th June 2015. I met HYM for the first time on May 6th, 2015 at Republic, Osu, when Inkfluent held a poetry, rap and music session headlining Ghalileo, the Rewrite Crew including myself, etc. As part of the Yoofi Hesse group, there were a couple of new faces who put up surprisingly passionate and stellar performances spiraling the audience into different realms. People were in the crowds cheering and asking for more! 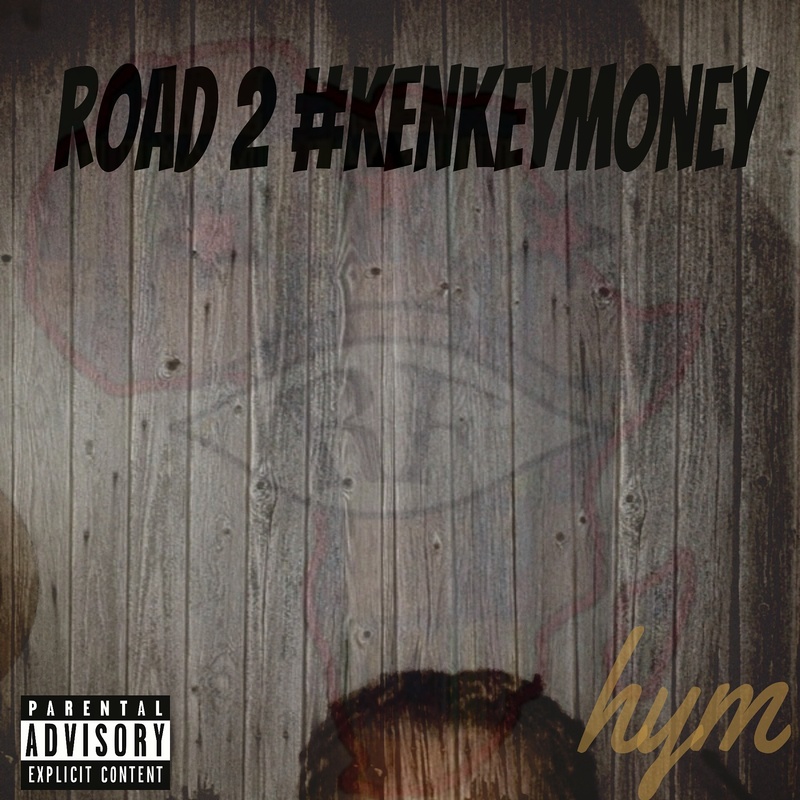 It’s interesting to get in touch with HYM once again, and this time track his musical growth, as he works on a soon to be released collection called the Kenkey Money Project. “After two years of putting in nothing but work, a lot of effort, time and energy making this project, I can honestly say the time is finally here. Please keep in mind that we are living in trying times and to be a musician and not shed light on some of the pressing issues of the past, now and tomorrow is nothing short of cowardice in my books,” he says. I write because I am sad, but I write mostly because I am ashamed. Ashamed because I am a civil engineer with a master’s degree in the built environment, who gained this degree by writing a thesis on the topic “developing sustainable urban drainage systems (SUDS) as flood mitigation measure in the Greater Accra Metropolitan Area (GAMA), Ghana”. A paper I was so proud of until now. I remember I had to start my thesis defense with highlights of the flooding problem in the city of Accra with historical facts on flood occurrences, and the loss of lives and properties from the 1930s to 2012. I remember doing this because my Swedish lecturers couldn’t clearly phantom flooding as a problem needing solving in 2012 at a city level. I further had to show previous research on flooding in the city, and the country as a whole. One showed the correlation between high-earn/low-earn communities and flooding in Accra, a topic not for discussion today, but one I shall surely write about soon. All these studies, my very own much included, have been shelved and gathering dust every day. We go through hell to undertake such studies, to gain degrees upon degrees, in various fields; Architecture, Engineering, Urban Planning, Real Estate, etc. ; at different level; bachelors, masters, doctorate, professorship, all in the aim of developing our built environment. Yet out of school, we go through life professional in the office behind a desk, work and get paid and worry not if we are achieving the aim we sort to study for, to make life better for everyone, everywhere. My master’s thesis alone, proposed solution upon solution on how the flooding problem in Accra can be solved. I proposed SUDS as the best solution for a city in a developing country, proposed case studies we should learn from, both in terms of design and policy and how these should be adapted to Accra. But after getting a Pass with Distinction for that study, my thesis is also gathering dust, both physically and mentally, because I too work and get paid and worry not if I am achieving the aims for with I undertook that study. Seeing this week’s events, over a hundred deaths, and all the properties lost, all because of floods, which should have been prevented by people like me through adequate design, proper construction and supervision, and forward thinking, I AM ASHAMED. I know what should have been done, how it should have been done, and even when it should have been done. I write because for now, this is me stating to do the right thing, taking a step in the right direction to help solve this problem. I do not have the mandate to break buildings in waterways, or initial slum upgrade problems, resort natural water bodies, or enact the policies to solve this problem. So for now I write, bringing my profession, skills and knowledge to bear, as a start to solving this age old problem. Maybe, just maybe if I write enough articles, propose enough solutions, share my thoughts, someone will hear and implement them. This is the first of many articles to come, my own way of giving back to my country Ghana. We as professionals (architects, urban planners, engineers, leaders etc. ), entrusted with developing our built environment to making them liveable have failed you. We have looked on over the years, with arms folded, and in some cases even helped destroy it, and for this we are sorry. I pretend to be speaking for us all but in actual fact; I can only speak for me. I have failed you Ghana, and for that I am truly sorry. I am sorry for letting you all down, Ghanaians deserve better from us, for we are all leaders, SO LET’S LEAD. 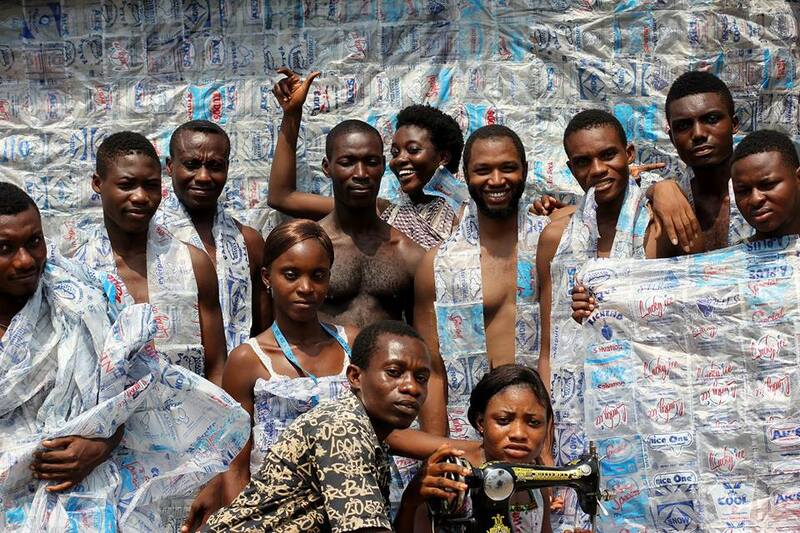 He displayed a large scale public installation just last month consisting of works made from discarded scratch cards found in the Accra La vicinity formally used to purchase cell phone call credits or Wi-Fi data bundles. 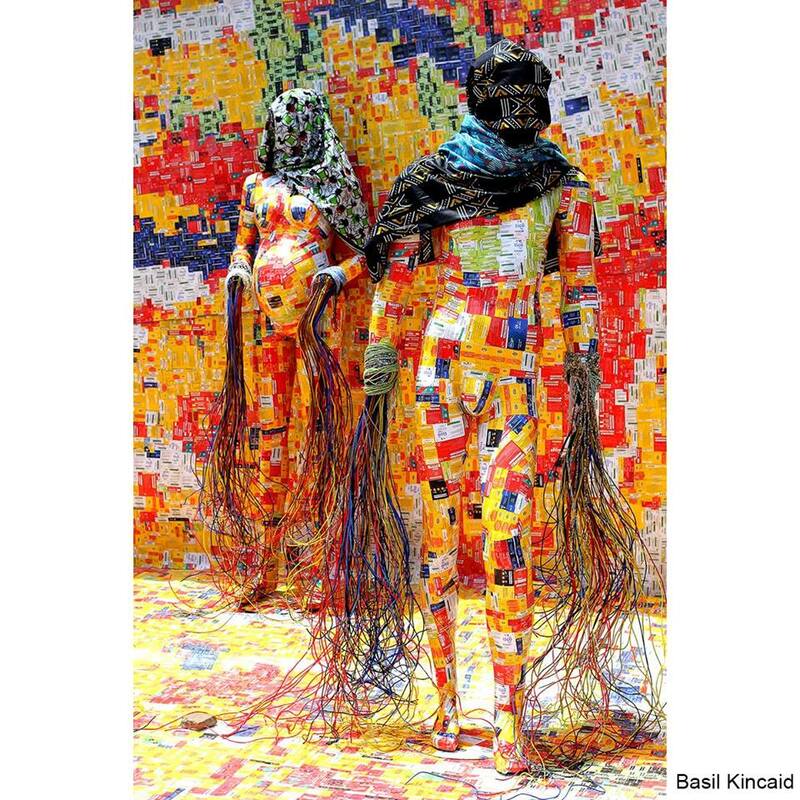 Baisil Kincaid has also put out works that address the ill-effects of plastic waste in the environment and why it is a threat to the environment at a faster rate. Recently, there was a flood that took lives in Accra and the serious sanitation problem is a main factor as majority of the population is conglomerating along the coasts, standing on the front row of the large plastic waste accumulation in the form of an ugly nebulous tide.